Presenting a traveling art exhibit, whether of paintings, sculptures, ceramics, illustrations, or books, is impossible for many libraries. The cost of packing, shipping, insurance , and security is just the tip of the iceberg. Adequate space must be found, as well as staff members who can plan and install the show. Then it must all be dismantled, and the same costs are once again paid for the removal. With library budgets being slashed all over globe, money for exhibits is one of the first things to go. But what if exhibits could be down-sized, along with budgets? 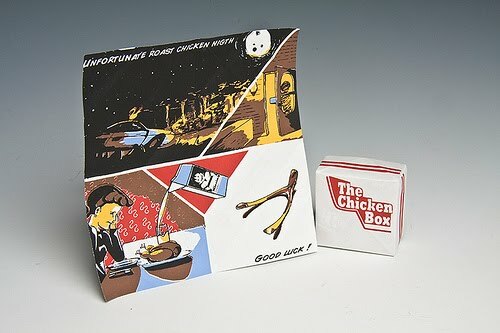 What kind of art show can fit in a container no bigger than a bread box? 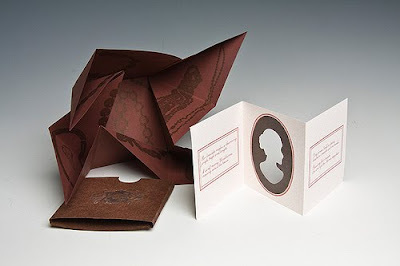 One that praises the God of Small Things: Monumental Ideas In Miniature Books. (MIMB) It's all about appreciating the large-scale beauty created by small-scale books. (An online version of the show is available on both a website and a flicker page.) As the director of the Myers School of Art, Del Rey Loven, explains: "Opening the pages of a miniature artist's book, we venture into a foreign world. Small objects like this are captivating, they transport us beyond the confines of our everyday experience and we are utterly consumed." Romantic Advice From A Christmas Cookie. 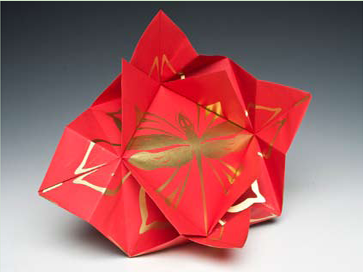 Hui-Chu first presented her idea for a traveling show of miniature books at a meeting of the Southern Graphics Council. 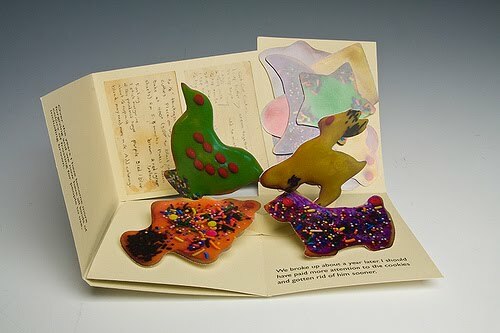 She invited everyone there to either create a set of books themselves, and/or to spread word about the exhibit to their colleagues. 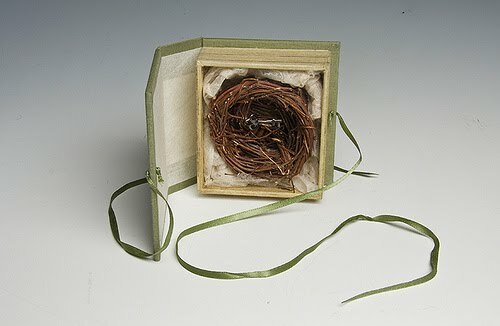 "I asked artists to create more than 5 editions of [each] miniature book for the MIMB project." The response was overwhelming. ''It spread by word of mouth and through the Internet. I had 141 entries from 12 countries," says Hui-Chu. "When the international artists submitted their books, I asked them if they thought they could find a place to show them, and they said, 'Of course!' '' The result: a show that has thus far traveled to 10 countries. The geographic diversity of the 90 books in the traveling exhibit, representing artists from Korea, Japan, Finland, Sweden, Germany, Spain, India, Pakistan, the UK, the U.S, Canada, Mauritius, and Argentina is matched by the wide variety of their styles, materials, and themes. None is larger in size than a playing card, yet they encompass many literary genres. Epic poetry, humorous rhymes, and tales told in prose, verse, and pictures are all represented. Images of graphic violence sit alongside delicate depictions of old-world beauty. The humorous nonsense verse of some books is contrasted with serious political statements of others. Some look like traditional books, while others are complex sculptures which must be "read" by the viewer in a very different way to discern their messages. 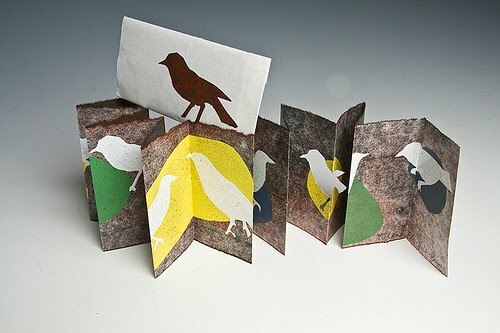 Techniques employed by the artists include printmaking using traditional relief, intaglio, lithograph, silk screening, and digital technologies. The artists were inspired to utilize photography, collage, photocopy, engraving, needle-work, quilting, sewing, origami, and a wide variety of paper crafts to illustrate their ideas. The books are composed of materials as varied as hand-made paper, cardboard, metal, wood, plaster, paraffin, porcelain, textiles, plastics, and even found objects, such as a Slinky and a wedding veil. 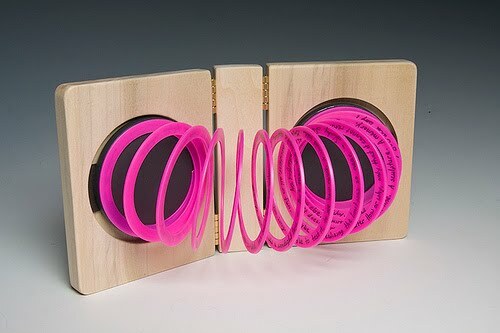 Plastic, Slinky, Wood, Paint, Hinges, And Magnets. The tiny works presented in Monumental Ideas in Miniature Books remind us that a book is never really contained in its cover. Closing a book cannot erase its images, words, or ideas. The one thing every book must do to be successful is to capture the concentration of the human mind. The impact of the ideas contained in a single volume correlate not to its physical size, but to the amount of thought the reader uses to comprehend them. And even in tough economic times, no one can diminish the riches of the imagination. But can you put a cow in a shoebox. You can put many of them in a book. Koenig, Simon, Herbert Berchtold, Rico Berchtold, and Mary E. Sullivan. Cows on Parade in Chicago. Kreuzlingen, Switzerland: NeptunArt, 1999. Print.